43-year-old father-of-six Francis McKeown, a well-known and popular shopkeeper from Andersonstown, was shot and fatally wounded on July 15, 1972 on the Shaws Road as he exited his work van to move a wire barricade. At the time Francis’ children were aged from 13 to just six months. Speaking at the office of victims’ group Relatives for Justice’s, Francis’ son Joe told the Andersonstown News that the family want their father’s name cleared and whoever was behind his killing brought before the courts. “The morning he was killed, our father, as usual, got up to open his three shops. He had shops in Leeson Street, the Springfield Road and in Lenadoon. He had been staying in his brother’s house in Stockman’s, my mother and the rest of us had been sent away to Portstewart as we had been told we’d be ‘better out of the way’, the Troubles were that bad. “He had got into his van to open up the shop at Lenadoon in Carrigart Avenue. As he drove up the road, his sister-in-law, who worked at the shop as well, followed behind him in her own car. It was some time around 8am and he was coming up the Shaws Road where there was a barbed-wire barrier blocking the road ahead. Our dad got out and tried to move the wire to one side, as he did a single shot was fired – but it missed him. He ran back to the van and a second shot was fired which hit him in the head. In the hours following the incident the British army released two contradictory statements on the shooting. In the first, they claimed there was a gun battle in progress and that Francis McKeown was one of the gunmen and had been seen carrying a Thompson sub-machine gun before he was shot. In their second statement they apparently retracted the earlier statement by saying they now believed the victim may have been caught in crossfire. “We know very little of our father,” explained Joe. “We would be grateful if anyone would come forward to Relatives for Justice. 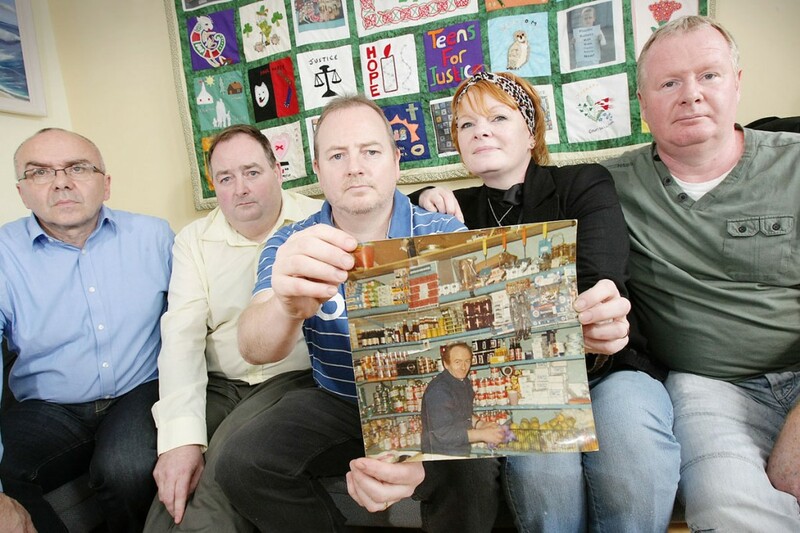 We would love for anyone to get in contact with the family to maybe even speak to us about our father – what kind of a man was he, do they have memories of him working in his shops? He was heavily involved with Casement Park and Rossa and we would love to see photographs of him during this time. An inquest into the killing of Francis McKeown was held in October 1973. None of the soldiers who were involved in the shooting or who witnessed it attended the hearing. The callous murder of the husband and father was not the first time the McKeown family had suffered at the hands of the British army. Just over 50 years before Francis McKeown’s murder, his own father, also called Francis, was shot and seriously wounded along with his two brothers at their home in Derry in May 1922. She continued: “The family has been devastated by the accusations put forward in British army press statements, that he was a gunman, in the immediate aftermath of the tragedy. The HET are now currently investigating the matter and the family hope that his name will be cleared of this wrongdoing. The official record will then confirm that he was an innocent victim of the conflict. “Relatives for Justice are concerned that a pattern has emerged in the investigation of British army killings. It appears that following any incident immediate army press releases have indicated, without substantiation, that the victims were either gunmen or involved in wrongdoing. It is clear that many cases before the HET have followed this pattern. The family of Mr McKeown totally reject any suggestion that he was a gunman. Francis McKeown should and will be remembered as a family man and a community businessman,” she said. “Yet again, a family, with the support of RFJ, find themselves accessing local media in order to make a call for witnesses to come forward. It is appreciated that this may be difficult for those who may have witnessed this incident. For almost four decades they have been searching for answers and the truth surrounding what happened on that fateful day. Anyone with any information about the Francis McKeown case is asked to contact Shauna or Paul Butler at the RFJ office on (028) 90 220100.